Small Søholm bowl - 4⅜" (111 mm) diameter, 2" (50 mm) high. Søholm Stentøj (pronounced 'Soorholm staintooy' - Søholm stoneware). In Denmark the 'ø' character (o slash) is equivalent to the 'ö' character (o umlaut) in Germany, Sweden and Norway. In very old Søholm pieces (around 1835 to 1878) the name will be marked Söholm. The company was founded in 1835 at Rønne, the principal town of Bornholm, a Danish island off the south coast of Sweden, and the name should not be confused with the town in Frederiksborg some twenty miles north of Copenhagen. The Wolffsen family ran the pottery from 1878 into the first decade of the twentieth century and pieces from that period are often marked with the names H Wolffsen or Chr. L Wolffsen. From around 1910 to 1930 management was in the hands of Carl Møller. 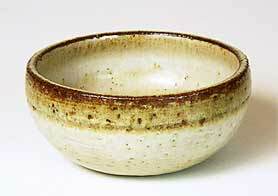 The use of earthenware was introduced after 1930 as an alternative to stoneware. Noomi Backhausen was a designer for Søholm from 1966 to 1990 and set up her own pottery in Rønne in 1996.